Welcome to the first in a series of new type of blog posts we will be bringing your way. The goal of these posts is to focus on features/modifications to Matomo (Piwik) you might not be aware of, as well as topics related to analytics in general. We are open to ideas for future posts as well, so don’t be shy to contact us and use the subject “Matomo Blog Topic Suggestion”. For the first article, I wanted to tackle the world of Custom Variables. 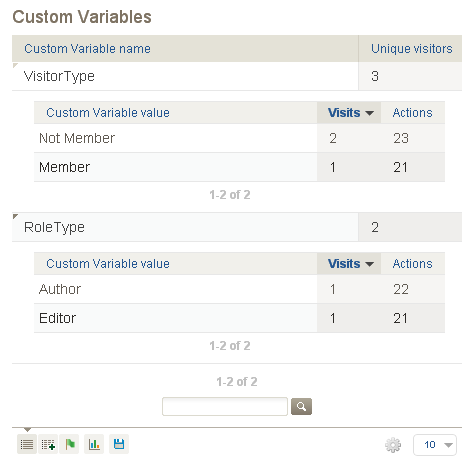 Note: If you are not already using Custom Variables to measure your custom data, read this article to learn about the concept, but then we recommend to use our new Custom Dimensions feature instead. Learn more: advantages of Custom Dimensions over Custom variables. Enjoy the power of Matomo! Before we move forward let’s take a slight detour to break down custom variables within Matomo (Piwik) a bit more. What does each part of this mean? Obviously the setCustomVariable, tells Matomo this is a custom variable, but what about the other bits? The first parameter, denotes this is the first of the five custom variables we are using for the visit. It is called the INDEX. You should only use unique index numbers unless you want to overwrite your data. In other words, if you create another custom variable and assign it INDEX 1, then it will start tracking this new variable. The second parameter in the string is known as NAME. In our example, this slot is taken by “VisitorType”. This is what will be used as the overall categorization of the variable. The third slot is what is known as “VALUE”. In our example this would be “Member” or “Non Member”. The last slot is taken by SCOPE. This determines how the information is stored. The “visit” scope means the custom variable will follow over the current session. The other option is “page”. This is useful if you have categories on your site, and you want to track how specific category landing pages perform. For more details on Custom Variables and the components, you can check out the documentation here. Now back to our lovely example. In the case of knowing if a user is a member or not, it requires a bit of code. But trust me it’s not that hard. Even with limited PHP skills and depending on the CMS or website you have built– what you need is usually easy to find. For example, in WordPress to determine if a user is logged in you use the function “is_user_logged_in“. Now it’s your turn. What are your favorite custom variables to track? What are some creative things you have tracked with custom variables in the past?